Life360, the mobile family locator utility whose recent claim to fame was outgrowing Foursquare in terms of its user base (the service now boasts over 40 million versus Foursquare’s 30 million+), is today announcing $10 million in Series B funding. The round was led by DCM and included participation from Life360’s existing investors, including Bessemer, BMW, Seraph Group, Fontinalis Partners (Bill Ford’s fund) and 500 Startups. The new round brings Life360’s total funding to date to $20 million. The company is planning to use the funding for various product enhancements, internationalization efforts and integrations with home-security and automotive partners. 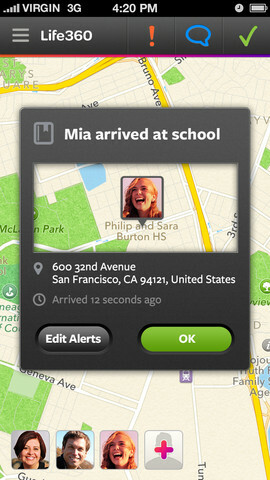 We recently talked with Life360 CEO Chris Hulls about the direction Life360 was headed. He explained that the service was not an overnight success, having launched in 2008 — and on Android first. A bit ahead of its time, users were not as comfortable with sharing their location via mobile back then as they are today. The company generally eschews the tech press, which is often more focused on the buzzier consumer web companies, such as the above-mentioned Foursquare. Plus, in an ecosystem where workers tend to skew much younger than the rest of the country, an app that helps better connect parents and children can sometimes feel like the mom-jeans app equivalent to the skinny jeans of far, far cooler services like billion-dollar baby Instagram. Although its buildup of users has been slower, Life360 this year committed to its revenue-generation plans, which before had only been experiments. It’s now offering a Premium product for $4.99 per month, which includes a 24/7 “Live Advisor” (similar to OnStar’s), roadside assistance, unlimited Places (venues you can geo-fence for location-based alerts like home,work or school), expanded location history, $100 in stolen phone protection, location lookups for non-smartphones and more. Because the paid tier is so new, the company has declined to discuss its conversion rate at this time. Given the Premium feature set, however, it’s not surprising that Life360 is now moving towards integrating its service into some in-car navigation systems. Through a strategic $3 million round from BMW closed last December, the service plans to allow drivers to simply direct the system by voice to navigate to a particular family member, instead of having to punch in an address. The company’s immediate plans for the additional funding will be on hiring and infrastructure — today, the startup is processing over 250 million API requests per day, putting infrastructure costs in the hundreds of thousands per month. On the near-term roadmap, Life360 will be introducing a product feature called “Circles,” which will expand on the ongoing private social networking trend to allow users to invite others like babysitters or extended family members into designated groups within the app. The lead in the Series B round, DCM, speaks to Life360’s international strategy. DCM invested out of a specific fund for mobile-first companies focused on Asia, the startup’s second-largest region in terms of overall users, as well as the fastest-growing, even though the app is not yet localized. That will change later this fall ahead of the app’s push into Europe and other regions. “DCM will be very helpful as we make a more aggressive push into the region and with internationalization in general,” says Hulls. Plus, the partner that led the deal was Jason Krikorian, but an Asian partner, Osuke Honda, was also very involved in the deal, and has a lot of experience in the region, he notes. Honda was an early investor in KakaoTalk, for example. Based in San Francisco, Life360 now has 32 employees.